In this cookbook, you will find a few of the many favorite recipes that the families of the Mt. Wesley Akin Nazarene Church in Southern Middle Tennessee turn thanks for on a regular basis. And you will learn a little about the church and our community along the way. 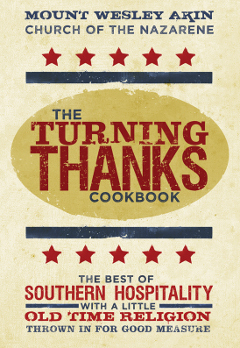 So pick up a copy of The Turning Thanks Cookbook. Get out your pots, pans, and dishes. Polish up those forks, spoons, and knives. And bring your appetite. There’s good eatin’ and friendly folks waiting. Who wants to turn thanks? So get out your pots, pans, and dishes. Polish up those forks, spoons, and knives. And bring your appetite. There’s good eatin’ and friendly folks waiting.